People living and working on the Florida coast face threats from hurricanes and storm surge, sometimes more than once a year. Scouring of beaches by wind and waves takes away sand, and beaches must be nourished with new sand, as often as yearly, in areas with high erosion. 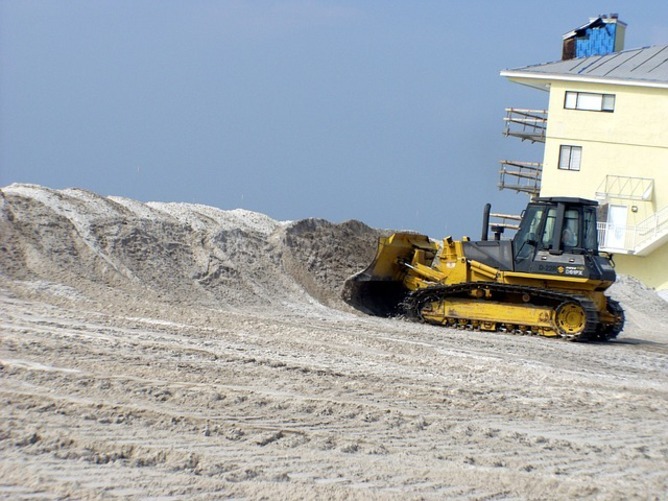 Miami-Dade, Broward and Palm Beach counties now have problems obtaining near-shore, low-cost sand. This means that they will have to use considerably more expensive alternatives to native sand that may negatively impact sea turtles or beach plants, diminish the quality of the beach environment and have adverse impacts to local communities that pay for beach re-nourishment. The threats aren’t reserved just for coastal residents. People in south Florida who live farther inland have homes and businesses on former wetlands that were drained in the middle of the 20th century. After a heavy rainfall, canals carry water to the sea. Should those canals fail, there would be massive flooding. Those canals also maintain a freshwater “head,” or buffer, that prevents salt water from intruding into the well fields that supply drinking water to the millions of residents. In this precarious situation, how is sea-level rise affecting coastal Florida, and what can we expect in the future? An important reality is that sea-level rise is not a future phenomenon. It has been happening slowly over the past decades, at about one inch every ten years. That’s a half foot since the 1960’s and already it is taking a toll. 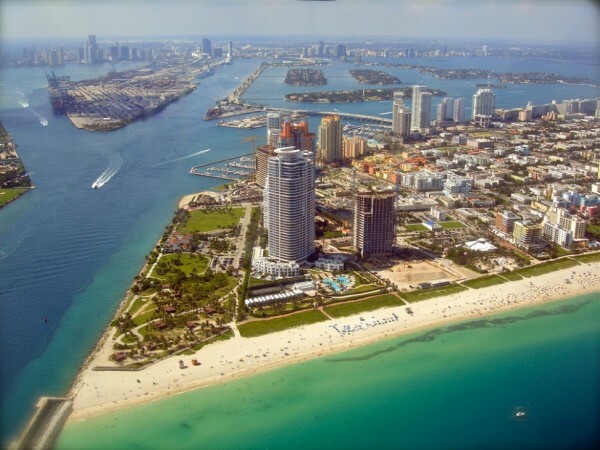 Areas of Miami now have flooding at high tide – a situation not observed in the past. The drainage system in south Florida is starting to fail. Flood control structures that take away rainwater by gravity sometimes cannot flow when the ocean side of the flood gates have a higher level of salt water than the upstream fresh water sides. Much of central Florida was developed on swampland that was drained and relies on canals. Storms cause flooding and rising seas make it more difficult to keep saltwater from penetrating freshwater wells. Why does one inch matter? When I lived in coastal Florida, one time a major rain event coincided with high tide, which made it difficult for water to quickly exit to the ocean. When water levels rose one half of an inch from the storm, my entire neighborhood flooded and water nearly entered my house. As we hastily tried to block all of the doors with tape and towels, it hit home what a difference one more inch of sea level would have meant – the difference between no damage and perhaps thousands of dollars of damage to our home. However, over many decades, we are looking at feet, not inches of rising sea levels. Three years ago, leading researchers convened at a climate change summit hosted by Florida Atlantic University, the research program Florida Sea Grant and the University of Florida to discuss the future of Florida under projected climate change and sea-level rise conditions. The picture these researchers paint is bleak. Between now and 2100, floods that happen every 100 years are projected to start happening every 50, then every 20, then every 5, until large areas of coastal Florida are under water. These experts’ discussions considered such dire things as: how to strategically abandon large areas of the Florida Keys; how animals that now live in low-lying areas will move to higher ground when human populations are vying for the same territory; and even how to reconfigure Miami into a series of islands on a historical ridge along the southeast Florida coast, knowing that at some point, even those ridges will be part of the ocean. 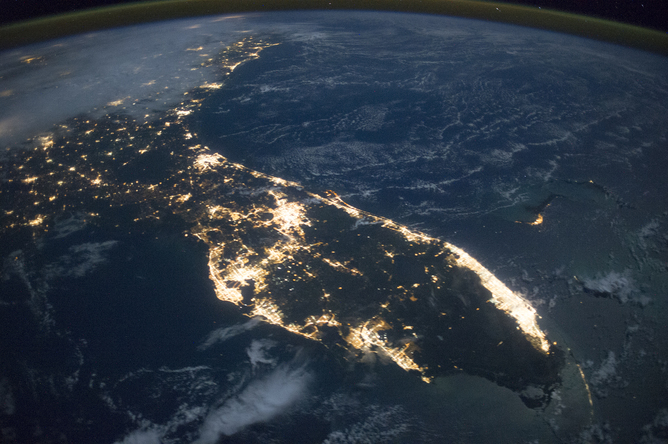 A coastal state: a photo of Florida from space at night shows how much of the state’s population is around the ocean – and vulnerable to sea level rise. There will be increased pressure to armor shorelines with seawalls to protect buildings from waves, but at some point this may not be effective because of escalating costs and the porous rock that underlies most of Florida, which will allow sea water to seep under seawalls. Rising seas will shift the beach inland, imperiling coastal roads, homes and businesses. Rising seas will stress coastal infrastructure (buildings, roads and bridges) because salt water will affect structural integrity. Saltwater intrusion will become more common in freshwater well fields near the coast. A sea rise of just six inches will require water conservation, waste water reuse, stormwater storage facilities and alternative water supplies including desalinization. It now is widely accepted that climate change is causing an unprecedented rise in sea levels around the world, and that locations such as Florida, where huge infrastructure and large populations live right on the coast, are especially vulnerable. As noted in the Oceans and Coastal Council report, the risks compel us to seek a more thorough understanding of the impacts, and provide current and future generations with the information needed to adapt. Ignoring climate change or dismissing it as ‘not settled science’ will only lead to more costly and complex decisions in the future and cause greater harm to our people and our economy. While the challenges presented by climate change and sea-level rise are great, challenges also bring opportunity. As Florida seeks to adapt to the changing future, it is an opportunity for us to engage in vibrant discussions at the local, regional, state and federal levels about the nature of our communities, how we want them to look in the future, and how to achieve our goals. Engaging in such conversations will help us learn and work together for the best possible future for our communities. Storms and risings seas are scouring sand from beaches that attract tourists, forcing some communities to import sand, some of it not native. Many communities around the state are already doing this. 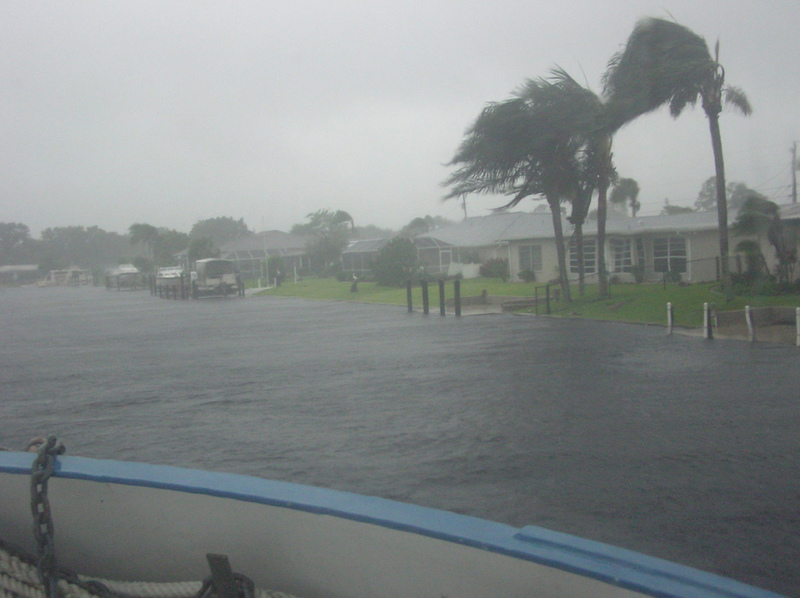 Southeast Florida has its Climate Change Compact, northeast Florida is working together under the Public Private Regional Resilience Initiative, southwest Florida and Punta Gorda as far back as 2009 developed the City of Punta Gorda Adaptation Plan. With such work, we can move towards a future which, while filled with challenges and different than the past, need not be only about loss, but also about what we can accomplish.